(Sensorless vector control: above 150% at 1Hz). - In case of fast acceleration/deceleration of motor, N700E series provides powerful torque controllability without trip. - Sensorless vector control technology expands the range of controlling speed. stable motor opeation can be achieved. - Ground fault protection can prevent accidents. - Countermeasure for output's phase loss protects motor while running. - Driving performance of acceleration and deceleration maximizes efficiency. - Built in PID function uniformly controls oil pressure and flow quantity without additional options. - Improved torque characteristic, which is reduced to the 1.7th power, perfectly fits with loads for fans and pumps. - Optimized energy saving according to the characteristics of loads is achieved. - The operational status of the inverter are displayed on the monitor so that an user can understand the condition of the inverter. - Cumulative hours of driving time and the actual running time are displayed for easy maintenance. 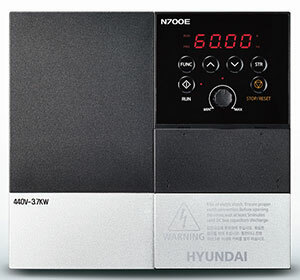 - N700E is available to replace the fan without separation. - Fan on/off function increases fan's durability and minimizes fan's noise.